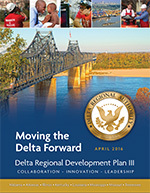 The Delta Regional Authority has updated its strategic plan. The Regional Development Plan III (RDPIII) builds and expands upon RDP II, the strategic plan which has guided the agency’s priorities and actions since 2008. RDP III will now guide the region’s economic growth over the next five years. GOAL 1. IMPROVED WORKFORCE COMPETITIVENESS: Advance the productivity and economic competitiveness of the Delta workforce. Build on the momentum of the Reimagining the Delta Workforce initiative to create a strong pipeline of skilled workers that will support and attract current and future employers in the Delta region. Improve the workforce readiness of the region’s K-12 students and adult population by increasing the number of internships, apprenticeships, work co-op programs, and other initiatives, with a focus on soft skills and employability. Create awareness of opportunities in Delta communities to attract talent from outside of the region. Continue initiatives to improve the health and wellness of the Delta workforce to elevate the productivity and competitiveness of the region’s employers. Pursue strategic initiatives to better leverage and connect the Delta region’s higher education institutions for workforce development and economic development. GOAL 2. STRENGTHENED INFRASTRUCTURE: Strengthen the Delta’s physical, digital, and capital connections to the global economy. Build and strengthen the region’s basic infrastructure (water, wastewater, electricity, and gas) to stimulate job growth and capital investment. Make strategic investments in the region’s transportation infrastructure (e.g. highways, railroads, ports, waterways, and airports) to support the growth of key industries. Expand and improve access to affordable digital infrastructure (e.g. broadband internet, cellular, and satellite access) across the region, especially in areas where it is currently deficient. Support state and local economic development organizations and local development districts in their efforts to put in place deal-ready sites for business recruitment and expansion projects. Improve capital access throughout the Delta, especially in non-urban areas where it is lacking most. GOAL 3. INCREASED COMMUNITY CAPACITY: Facilitate local capacity building within Delta communities, organizations, businesses, and individuals. Develop new strategic initiatives and continue existing programs that build capacity among local leaders in Delta communities. Emphasize programs and investments to advance entrepreneurship and high-growth business development in Delta communities, ensuring the unique innovation assets found within the region’s urban areas are leveraged to benefit the entire region, including rural areas. Continue to work with the White House Rural Council to support and expand initiatives that further the DRA’s and the Administration’s shared priorities. Enrich the quality of place of Delta communities through creative place-making. Encourage initiatives centered on social innovation, social entrepreneurship, and social equity to address critical challenges facing Delta communities while also providing opportunities to attract and retain talent. Download the Regional Development Plan III here.